Among the various types of volcanoes, the shield volcano is the least violent and has really only one form of eruption: that of a spilling and flowing of magma -- lava -- moving outward from its point of origin. 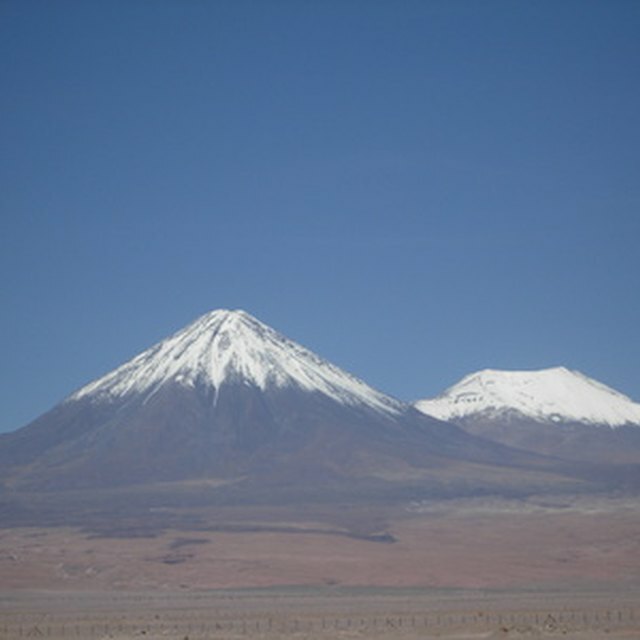 Shield volcanoes create gently sloping hills and mountains with a more-or-less domed shape, unlike the rough and craggy mountains caused by other types of volcanoes. These lavas are basaltic in composition, hence their dark color. Shield volcanoes comprise some of the largest in the world. The most famous example of shield volcanoes exists in the Hawaiian Island chain, which is made up entirely of this type of volcano. Northern California and Oregon also have large shield volcanoes with bases as large as four miles across. The lava flows from shield volcanoes is primarily of two types, pahoehoe -- pronounced "pah-hoy-hoy" -- and a'a (pronounced "ah-ah," said sharply). Both these types originate from surface eruptions, while a third type, pillow lava, is more likely to form from undersea eruptions. However, pillow lava can also be formed from pahoehoe lava that flows over the edge of the land and into the sea. As it meets the sea, copious amounts of steam arise, cooling the lava; but the lava is still exceedingly hot as it continues to move underwater. The cool sea water acts to begin the cooling process and slows the flow of lava, causing it to form into bulbous mounds, resembling pillows. 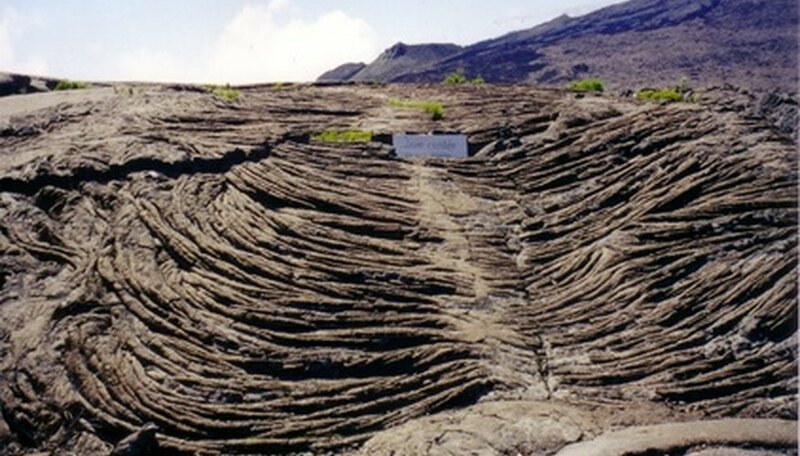 The Pahoehoe flow is much thinner than a'a lava, so it travels faster, causing it to bunch up into wide bands resembling rope. When it cools, it is smooth to walk upon. A'a lava, on the other hand, flows more slowly and, while still a basaltic lava, is much thicker. It has a much chunkier consistency. Geologists do not have a full explanation for these differences, as the two types are the same, chemically speaking. They know that pahoehoe can change into a'a, but never the other way around. Lava tubes are some of the most interesting features produced by shield type volcanoes. Typically, they will follow the course of a river or other geological feature with a downhill slope. As the surface of the lava cools, it acts as insulation for the still-hot lava underneath, which continues to flow. As the eruption subsides and stops, the lava tube will become hollow as the last of the hot lava runs downhill. When the tube has fully cooled, (this may take many years), it has become a type of cave. What is interesting about lava tube caves is that because they have followed a feature such as a river, there are usually no complex twists and turns as are found in limestone caves. Therefore, it is almost impossible to get lost exploring a lava tube cave. Usually, they will pinch off into a dead end as they near the source of the original flow, and the explorers can simply turn around and exit the way they entered. Lisabet Ellis began writing for publication in 1980. She did editing, copy writing and design for "Nuggets," the monthly newsletter of the Pacifica Girl Scouts Association. Ellis also scripted, produced and hosted a video documentary and desktop-published a book of poetry. She holds an Associate of Arts in liberal arts from Skyline College. What Are the Types of Eruptions From Most to Least Destructive? Ellis, Lisabet. "The Types of Eruptions That Shield Volcanoes Have." Sciencing, https://sciencing.com/types-eruptions-shield-volcanoes-7408884.html. 24 April 2017. What Types of Volcanoes Are Violent With Steep Slopes?